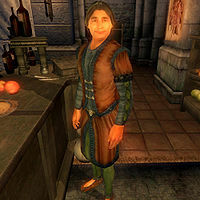 Ley Marillin is the innkeeper at The King and Queen Tavern in the Elven Gardens District of the Imperial City. He spends all his time selling food and beds, never eating or sleeping. He wears a set of middle class clothing: a russet felt outfit with a pair of russet felt shoes. He carries a pair of burgundy linens, the key to his tavern, an iron mace and a small amount of gold. Speaking to Marillin for the first time or occasionally afterward while inside his inn will have him greet you by saying: "Welcome to The King and Queen Tavern. We treat all our patrons like royalty! I'm Ley Marillin, your loyal seneschal." Asking him about the Imperial City will have him suggest that you seek out a resident of the city: "A wealthy gentleman in the Talos Plaza district named Umbacano collects Ayleid artifacts. Perhaps he has use for someone like you." Inquiring if he has a room available to rent will have him inform you that he has lodging available: "Need a place to rest? I have a room available, if you'd care to rent it for a night." Telling him that you currently do not wish to rent the room will have respectfully acknowledge your choice, with the occasional reminder to visit him again if you change your mind. Asking to rent the room without at least ten gold in your inventory will have him angrily refuse to accommodate you: "I'm not about to rent you a room if you can't pay for it." Agreeing to rent the room with the appropriate funds to do so available will have him accept the payment, and point you in it's direction: "Very well. Head up the stairs, and it's the last door on your right. Sleep well." Asking him about the room again will have voice his assumption that you find the room to meet your standards: "I trust the room is satisfactory." Esta página foi modificada pela última vez à(s) 03h24min de 22 de dezembro de 2013.